For more than a decade, thousands of Santas have taken over major city downtowns in what’s known around the country as the annual “red tide.” The Queen City’s version, Cincinnati Santacon, has expanded each year with the help of a booming number of participating bars and restaurants. Here are a few tips to help you survive Santacon on Saturday, December 8, without being added to the naughty list. SANTA SWAG The first step to getting in the holiday spirit is dressing the part. Stick to the classic red suit, fluffy hat, and black belt—white beard optional. Grab a suit at the downtown Cappel’s for $70 or order off Amazon for as little as $7. CHOOSE YOUR OWN ADVENTURE With more than 5,000 Kris Kringles expected, it’s best to divide and conquer. Follow the North Pole or South Pole routes; you’ll find discounts along both. 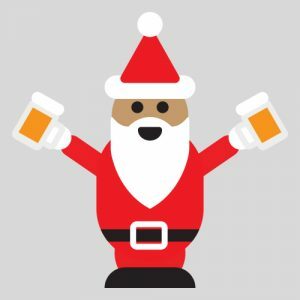 NORTH POLE Pick up an official Santacon wristband at Rhinegeist Brewery to gain access to exclusive specials at restaurants and bars like Queen City Radio, MOTR, and even Skeleton Root winery. SOUTH POLE Kick things off by grabbing a wristband at Holy Grail. Nearby Tin Roof will host live music on one of its busiest “holidays” of the year (on par with Reds Opening Day). OFF THE BEATEN PATH Looking to escape the crowd? Break the schedule and stop by board game parlor The Rook, which will offer all day drink specials, including speciality holiday cocktails. CARB-LOAD Let’s be honest, being Santa is hard work. Reward yourself and your stomach with a $2 slice of Lucy Blue Pizza along both routes at the downtown and Over-the-Rhine locations. PRACTICE YOUR PIPES When you mix Santas and alcohol, uninhibited caroling is sure to ensue—meaning now would be a great time to brush up on your reindeer nomenclature. NO MAGIC SLEIGH Tipping back holiday libations and driving don’t mix. While you won’t have Rudolph to guide your way, take advantage of the Cincinnati Bell Connector. The Pedal Wagon will offer free rides to Santas. RESPECT THE SUIT With great power comes great responsibility. Remember, you have a reputation to uphold and, equally important, the event benefits charity. So save some dollars for The Cure Starts Now, which received $25,000 last year. Check out cincinnatisantacon.com for more information, including a full list of participating locations and specials.